It’s Good to Be a Yost Realty Group Client! Enjoy Free Perks, Like Our Moving Truck! 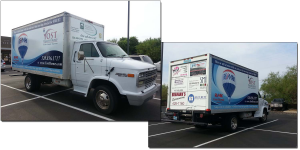 As a client of Yost Realty Group, you may use the moving truck for a variety of purposes, from moving furniture to picking up a new washer and dryer. With our moving truck you won’t have to call around to check rental prices – simply call our office to reserve the truck and pick up the keys. It’s that easy! Local use only including Casa Grande, Arizona City, Coolidge, Eloy and Maricopa. Limited to a two day maximum. Drivers must be 21 years of age or older with current proof of insurance. Use is based on availability on a first come, first served basis. We kindly request that you fill up the gas tank prior to returning the truck. Free copier use, reasonable copies please. Recommendations for repair and service companies. Free market analysis for insurance or resale purposes. Free notary public, please call to schedule an appointment. Referrals to top agents in any city in the world!